Outgoing Sen. Bob Corker (R., Tenn.) is teeing up another parting shot to President Trump by facilitating an effort to undermine his choice to lead the nation's taxpayer-funded global broadcasting operation, according to several GOP sources. The same day Corker rebuked Trump by supporting a bill forcing the United States to withdraw from Yemen, the vocal Trump critic quietly held a Senate Foreign Relations Committee vote approving a bill that would greatly curtail the power of Michael Pack, the incoming new head of the U.S. Agency for Global Media, or USAGM. Corker, who is retiring at the end of the year, and Sen. Bob Menendez, (D., N.J.), who sponsored the bill, are rushing the bill through committee this week in an effort to attach it to the government funding bill that must pass before Congress adjourns at the end of the month, according to several government officials. The USAGM is formerly the Broadcasting Board of Governors. Pack is expected to win Senate confirmation next year when Corker is no longer chairman of the Senate Foreign Relations Committee. With an annual budget of roughly $680 million, the USAGM governs the Voice of America, the flagship U.S. broadcasting service, which was created more than seven decades ago to counter propaganda from repressive regimes with coverage that promotes freedom and democracy worldwide. Critics say the Menendez measure would prevent Pack from firing any top officials at the VOA and related agencies, including Amanda Bennett, the controversial current VOA director who is at the center of a fierce partisan battle over her leadership. 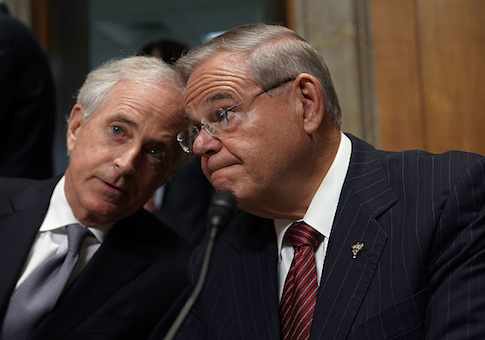 Corker and Menendez have held up Pack's confirmation for months. The bill makes the current board members, many of whom were appointed by President Obama and are operating on expired terms, the members of the advisory board. The motivations behind undermining Trump's choice to head the agency are particularly clear, the critics argue, when you consider that Bennett and the current head of USAGM, John Lansing, and their supporters on Capitol Hill backed a bill aimed at emboldening the head of the same agency and crippling the board of governors' power in 2016 when they thought Hillary Clinton would win the presidency. "This is the complete opposite from empowering the CEO because this neuters the CEO by preventing him from appointing the right head of the entities he's in charge of and requiring approval from the advisory board," one conservative critic of the measure told the Washington Free Beacon. "The people there now who are supporting Amanda Bennett are the same people who supported the measure in 2016 to keep her in place and give her more power. It's Machiavellian in this way," the critic said. Some hardliners on Cuba are supporting the measure because they believe it would protect the new head of the Miami-based Office of Cuban Broadcasting, or OCB, the governing organization for Radio and TV Marti's governing organization. Trump recently appointed a new OCB director after complaints that the U.S. Cuban broadcasts had been softened to support Obama's détente with the Castro regime. However, the bill's detractors said that view is short-sighted considering that Pack would not be able to fire Bennett and other top officials without the advisory board's consent. Pack is a documentary filmmaker who previously served as a Corporation for Public Broadcasting executive. More recently, he ran the conservative Claremont Institute and its Review of Books. His critics on the left cite his ties to former White House adviser Steve Bannon as cause for concern. The pair worked together on two documentaries. Pack also has spoken out against liberals having a politically correct "stranglehold" on colleges and universities, particularly film schools. Under Pack's direction, liberal critics say they are worried that Trump officials could get too involved with USAGM operations, and it could become a mouthpiece for the administration ruining its global reputation as an independent journalistic voice. MSNBC's Rachel Maddow early last year warned that a retooled VOA with a Trump appointee could become a "state-run media operation" and a megaphone for Trump's policies abroad. Conservative supporters of new leadership at the broadcasting agencies say Bennett and others are worried that coverage will cease to tilt leftward and will no longer highlight and prioritize explicitly anti-Trump coverage. Rep. Ed Royce (R., Calif.), the outgoing chairman of the House Foreign Affairs Committee, has long supported efforts to reform the BBG, now USAGM, and give the agency's leader more power. He authored the 2016 bill that would do just that. A spokesperson for Royce on Wednesday said the committee is aware of the bill and is reviewing it. "As you may know, Chairman Royce authored the law to abolish the part-time board that had been deemed ‘defunct' by both Democrats and Republicans. He's long believed we need an empowered CEO to help modernize and revitalize U.S. international broadcasting to better counter propaganda from Russia, North Korea, ISIS, and others." In March, Royce encouraged Trump to replace the Obama-era leaders of the then-BBG and name new leadership to fix the "broken agency" and help counter Russian President Putin's sophisticated propaganda machine. The State Department was asked to sign off on the legislation by close of business Wednesday because the bill gives the secretary of state a stronger voice on the advisory board, sources said. Asked if Secretary of State Mike Pompeo supports the measure, a spokesman said the State Department does not comment on pending legislation. Corker's office did not provide a response to the Free Beacon‘s question about his support for the bill. Bennett is a Pulitzer-Prize winning Wall Street Journal reporter and former top editor at the Oregonian and columnist at the Washington Post. She is married to Donald Graham, the former owner and publisher of the Washington Post and the son of legendary publisher Kay Graham. She was appointed VOA director by President Obama in April 2016. Earlier this week, Bennett stoked additional partisan turmoil over the future of the USAGM and VOA by penning an op-ed taking Trump to task for suggesting in a tweet earlier this week that the United States should create its own "worldwide network to show the World we really are – GREAT!" Bennett placed the op-ed in the Washington Post, the newspaper her husband previously owned. In the piece she claimed that the 76-year-old VOA is a powerful force for good in the world because it provides news and coverage of Washington and international events free from any administration's meddling. "We export the First Amendment," she argued. "We cover the toll of the opioid crisis and how people combat it," she wrote. "We show troops massed near the U.S. border and migrants throwing rocks. We interviewed people both shocked and elated by Trump's election. We cover killings by white supremacists and marches by #MeToo protesters." "Our audiences see a country strong enough to criticize itself—a nation struggling openly with its problems," she said. The Bennett op-ed drew immediate scorn from Sasha Gong, one of five former employees of VOA's Chinese language division whom Bennett placed on administrative leave and threatened to fire last fall for conducting a controversial interview with a prominent exiled Chinese dissident. The Free Beacon‘s Bill Gertz first reported about their threatened firings. Gong, as well as Fred Wang and Robert Li, were placed on suspension and investigated for alleged insubordination and violating the radio's reporting rules. Gong, however, disputes the reasons for her problems with VOA leadership, saying the live, three-hour interview with Guo Wengui, an exiled Chinese billionaire living in New York, was approved by VOA management but was cut short by VOA officials under pressure from the Chinese government. Gong on Thursday urged President Trump to save the VOA and get rid of Bennett. She complained that the impasse on Pack's nomination has handed control of the agency to Obama holdovers and recalled how criticism of the agency has come from both sides of the aisle. She referred to a comment then-Secretary of State Hillary Clinton made to Congress in 2013 that "Our Broadcasting Board of Governors is practically defunct in terms of its capacity to be able to tell a message around the world." Gong argued that under Bennett's leadership, the VOA has gone further downhill and has veered off on a highly partisan, anti-Trump path. She blamed Bennett for that problem and said she made no bones about openly supporting Hillary Clintons presidential campaign in VOA coverage, to the detriment of both Donald Trump and Democratic rival Bernie Sanders. She also said Bennett could did not hide her disdain for Trump after his surprise victory. Those sentiments echoed those of a former VOA acting associate director Ted Lipien who wrote in an op-ed in the Washington Examiner that "a small group of partisan managers and a few biased reporters who hate Donald Trump with a religious passion have transformed what used to be an effective U.S. tool against totalitarianism into their own partisan soapbox. In doing so, they have intimidated and marginalized the rest of the VOA workforce." Gong also derided Bennett's claim of exporting the First Amendment, citing her own experience of being fired after the Chinese government exerted pressure on VOA leadership. Bennett's office referred a question about the Menendez legislation to the USAGM, which did not respond to a request for comment . The VOA released a lengthy statement Thursday morning saying it had removed one Mandarin Service employee and given a period of suspension to another—both incidents relating to the interview with Wengui in April 2017. They could not name the employees involved because of privacy laws. The VOA said its leaders had been concerned that Wengui would make accusations that would be broadcast "without the opportunity to vet the accusations for accuracy or give the other side the opportunity to respond—a clear breach of journalistic ethics." VOA leaders, they said, had issued specific instructions to the interview team to limit the interview to no more than one hour and prohibit any extension of the interview over social media and prohibit any use of unverified documentation or materials during the broadcast but to continue to tape the interview for as long as necessary to produce material for a later, "properly vetted broadcast." Despite the instructions, the Guo interview continued past the one-hour mark through use of a social media livestream and during the interview there were recordings played that Guo provided that VOA had not had the opportunity to authenticate, the VOA said. "The actions follow four independent investigations that all concluded the interview's termination was a result of VOA leadership's attempt to enforce previously agreed-upon journalistic standards," the statement said. "The investigations found no evidence to support allegations that pressure from the Chinese government, purportedly driven by ‘spies' within VOA, had caused the termination." The VOA said the investigation upheld the actions by the VOA leadership, concluding that the "unprofessional abrupt termination resulted from a series of apparent failures to follow explicit instructions from management and good journalistic practices." This article was corrected to reflect that Bennett's office referred a question about the legislation to the USAGM, which did not respond to a request for comment, and that Bennett put five employees on administrative leave and that USAGM is an independent agency.